Construction delays on the new Lucas Oil Stadium in downtown Indianapolis meant the 2008 DCI World Championships had to move to Indiana University’s Memorial Stadium in Bloomington. The season offered up an above average number of upsets right up to the final day. In July, Carolina Crown beat the Cadets for the first time in history, ending with a fourth-place finish in Bloomington to the Cadets’ fifth place. Blue Stars stormed into 8th place after not being in the World Class Finals for the previous 28 seasons. And in early July, Phantom Regiment lost to Santa Clara Vanguard, a corps that would place seventh in Bloomington. Regiment’s surge seemed to start in Allentown, a week prior to the World Championships. A third-place finish in the Quarterfinals set the corps up for a second-place finish in the Semifinals, 0.375 under the Blue Devils and 0.125 above the Cavaliers. In the Finals, the corps edged the Devils by the smallest margin possible—0.025, a quarter of a tenth. Another corps with momentum on its side was the 12th place Madison Scouts. In the last half of the summer, the Scouts finished below the 12th spot at major events in San Antonio and Atlanta. So it was a major relief to the corps members when they edged into 12th place in the World Championship Quarterfinals, just two tenths of a point over the Crossmen, and then slightly opened that scant spread to 0.325 points in the Semifinals. 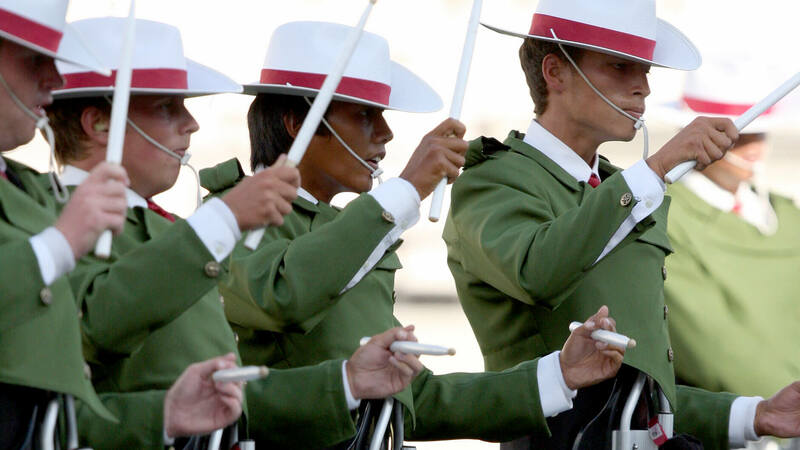 “La Noche de la Iguana” played off the corps’ longstanding success with fiery Latin music, presenting the effect of music drifting across the field as if wafting out of a Latin American nightclub. The title came from the Spanish interpretation of the title of a 1964 movie, “The Night of the Iguana,” starring Richard Burton, Ava Gardner, and Deborah Kerr. The movie was based on a drama of the same name by famed playwright Tennessee Williams, its second half set in Mexico. Much of the movie’s soundtrack was of the type of Latin music the Scouts exploited in their production, tinged with intrigue and sweltering tension, and accented by tropical ethnic percussion. The show was loosely divided into three parts, “Inteligencia” (Intelligence), “Pasión” (Passion), and “Progreso” (Progress). It was said that the musical works explored the evolution of Latin-American music from the pre-Columbian Mayan society to the Latin America of contemporary times. Revueltas was a Mexican composer and violin virtuoso who attended the Chicago Musical College for formal musical training. The work came from the first movement of a four-movement symphonic suite arranged by conductor Jose Ives Limantour, extracted from Revueltas’ score for a 1939 movie of the same name. The movie was set in the time of the Mayas. The bulk of “Inteligencia” was given to “Danza de los Duendes” by Nancy Galbraith, a professor of composition at Pittsburgh’s Carnegie Mellon University. She wrote the piece for orchestra in 1991 and arranged it five years later for concert band. Duendes are mythological South American goblins; however, the malevolent-sounding piece wasn’t titled until after it was written. A visual highlight was one of the corps’ famed mass horn line pivoting fronts that extended from the front of the field all the way to the back. Argentinian composer Alberto Ginastera wrote the four-movement “Estancia Ballet” in 1941, drawing his favorite melodies from a previous ballet, mostly in an effort to save the music from certain obscurity. Without further intervention by Ginastera, the music would have never been heard, as the commissioning Ballet Caravan from New York disbanded prior to the scheduled premiere. Music inspired by themes of the ballet served as the brief third and final selection in the “Inteligencia” section. Two works made up the show’s “Pasión” segment. Mexican composer Arturo Márquez wrote the darkly intense “Danzón No. 2” in 1994, based on the official dance and musical style of Cuba that is also quite popular in Mexico. Danzons are typically slow dances for two people, based on syncopated beats, which are strongly enhanced by the shifting accents of the work. The music style was further influenced by the nations that occupied Cuba over the centuries, including Spain and England, with additional influence from African immigrants and the French. Ginastera’s “Harp Concerto,” commissioned in 1956 by Philadelphia Orchestra harpist Edna Phillips and her husband, wasn’t completed until 1965, after Phillips had retired from performing professionally. The piece was noted for its use of unusual sound effects, such as knocking on the wood of the harp and playing glissandos with the fingernails. It was the knocking on the harp soundboard that provided the impetus for the Madison Scouts’ percussion feature, with eight members of the front ensemble performing on cajons, square wooden drums played by the hands while the performer sits atop the drum. The show’s final “Progreso” segment was delivered by Mexican composer Gabriela Ortiz’s “Concierto Candela for Solo Percussion and Orchestra,” composed in 1993. The music represented the vibrant and frenetic modern day Latin American culture, highlighted by Ortiz’s combination of classical Mexican folk music with avant-garde jazz, with a heavy on-field dose of wooden percussion and blaring brass. This week you can save on the World Championship DVD set that contains this complete Madison Scouts performance, along with all finalists from the 2008 DCI World Championships. Buy the 2008 World Championship DVD set. Discount DVD offer available for a limited time only. Michael Boo was a member of the Cavaliers from 1975-1977. 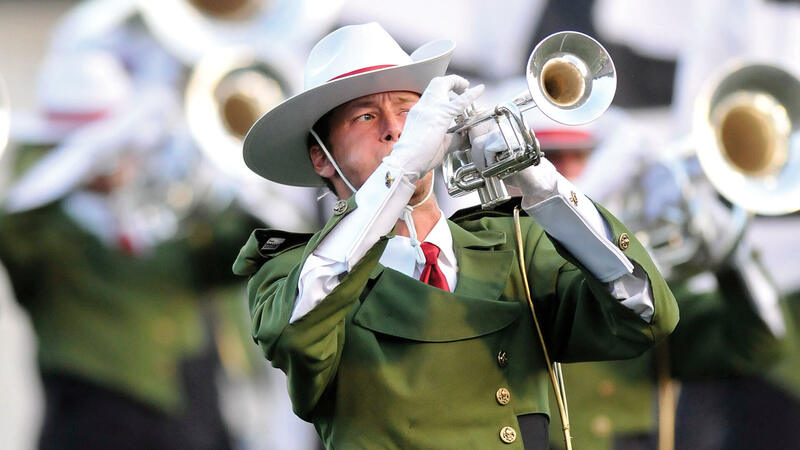 He has written about the drum corps activity for more than a quarter century and serves as a staff writer for various Drum Corps International projects. Boo has written for numerous other publications and has published an honors-winning book on the history of figure skating. As an accomplished composer, Boo holds a bachelor's degree in music education and a master's degree in music theory and composition. He resides in Chesterton, Indiana.